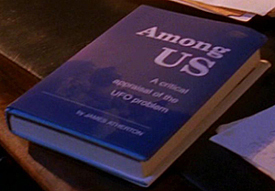 An enterprising Roswell fan, Dr. Derek Lamar, has written several items as if they were excerpts from the book 'Among Us' by James Atherton, and has given permission to share them on the site. Who was James Atherton? What was 'Among Us'? James Atherton wrote the book 'Among Us' that Milton gives to Max. Milton describes Atherton and the book briefly. "James Atherton was the first to publish on the '47 crash. He authored several books, most notably 'Among Us' published in 1955." "A bit on the alternative side. Atherton had an underground following...never truly embraced by the mainstream, such that it is. But it may be of some interest to a true believer like yourself." Unfortunately we never get a much of an idea of what is in the book. Max reads one quote from the book to Michael and Isabel. "He says...this guy is nuts...that aliens wouldn't possess the lung capacity or brain capacity for more than short-term survival on Earth." I've always wondered what the book might be about, and now we have some fan-created excerpts to fuel the imagination. Thanks to Dr. Lamar for allowing me to post these. Do not repost without permission. It was windy that day but by the time night wrapped itself around us there was a stillness in the chilly night. The skies were clear and the stars were incredible. The Milky Way swirled above us like an infinite wispy cloud which had been lightly smeared across the desert sky. How could there not be life out there when there were millions of people on this planet who could barely live a full day in conscious anticipation of anything other than a repeat of the day before. I heard those stories about so-called aliens but what does that really mean. Life is life, isn't it? Do we not seek to discover more about ourselves when we choose to seek out new forms of life. It always seems to be that we discover something about ourselves that we need to know. Knowing seems to be the criteria. To search the unknown in order that we come full circle with who we are, where we are going, and what exactly is our destiny. The moon was at a weird angle that night. It looked like it had been cut in half. But the sky was clear and warm with a Santana breeze blowing through. I got a phone call that something crashed 5 miles outside of town but I wasn't the only one who was checking it out. There were three helicopters positioning themselves like a triangle over the entire area. There was some smoke in the distance. A couple military vehicles passed me going about 70 miles per hour and I knew I wasn't going to get anywhere near whatever this was. I knew this canyon pretty well and took a dirt road toward the North where there was a piece of high ground that would give me a good observation area. I was there in about five minutes. I remembered my binoculars this time but as I raised them to my eyes someone put a hand on my shoulder. I wanted to scream but I couldn't make any audible sounds. Suddenly I felt very calm as I looked into the eyes of this man, about my height, but with a slight glow all about his body. I heard him say: "Don't be afraid." But his lips didn't move. I then realized I was hearing it in my mind. Roswell was a simple part of the Southwest but this seemed to be a whole new adventure for everyone, that's for sure. "Who are you?" I managed to actually ask with my voice. "I am Bernaar. We are from the Phelandes quadrant. We are not from your planet," he responded. "What is it that you want on this planet?" I said nervously. I didn't know what to ask. What he said really shocked me. He said, "I am here, with my friends, to bring a new spiritual understanding to the people of Earth. It is our understanding based on previous visits and mathematical computations that this planet is undergoing changes of the mind, of consciousness, and that many are ready for a new understanding of the universe and of themselves." I asked if it had anything to do with God, was that what he was talking about and he smiled and said: "It does, but something more than that. It has to do with a new understanding of what God is and what Man is and how connected they are. It has to do with a new understanding of reality itself and how the appearances of our everyday lives were very misleading compared to what real reality is but that our current reality was a projection of the belief system we were currently operating under. As quick as he had appeared he was gone. I began to wonder if he was ever there at all. "When the shadowy figure approached me my impulse was to run. I turned to move and steadied myself for the kick-off grip of my boots to get the traction that I would need. But all of this was happening in my mind. My body wasn't complying with the commands my brain was sending to it. I was frozen in place and the only thing moving was a stream of paranoid thoughts busy connecting the dots of a worse case scenario. As the figure continued to move closer to me I began to make out humanoid features. I had images in my mind of one of those Close Encounter creatures, or "Grays" as they call them, but other than his clothing, he looked like anyone you would run into at a Downtown restaurant on a weekday. The main difference was rather than looking away he continued to focus on me. He put his hand on my arm as if to guide me and asked: "Would you like to sit down?" It was then I realized I was no longer outside along the wet highway but somewhere inside a room with a chair, a table, what looked like a computer of sorts and some cabinets and other utilitarian items. I stammered and replied: "Yes... yes... I'll sit here... thank you." A calm had started to settle in. In fact as soon as his hand touched my body it was almost a mental healing which took place and all of my anxiety dissipated. I began to realize that maybe there was more going on here than little green men from Mars attacking Earth with weapons of an advanced nature. "I started to look about the room and could see through an open doorway to my left. There were beings walking back and forth. Only once in awhile would they glance in my direction. The being of humanoid appearance who was with me said his name was Dre-zan. I asked what his last name was and he chuckled and said it would probably be Carpolis because that was the city he was from on his home planet. I then realized that I wasn't speaking out loud but rather we were carrying on this conversation on a telepathic level. Then I began to think that I was hallucinating. How would I ever know when it was real and when it was my imagination. Suddenly he spoke out loud and said: "We were talking. You are not hallucinating." He continued and said: "Essentially one must realize that in Ultimate Reality there is only ONE MIND anyway and despite the fact that we believe in duality and think we are separate from each other, the truth is, we are all of the same Consciousness." I had heard of this theory before but it never occurred to me that it might actually be true. Now my whole world was turned upside down and I had to recollect my thoughts and begin to take account of what was of value to me in what I still believed. I felt that my world was collapsing and my identity would begin to change as well. There was a man lurking in the doorway when suddenly a flash of light made it impossible to see anything else in the room. The burst of light was soon gone even though it seemed to all be happening in slow motion and then the room was left in a glowing state like embers in a fire. As the hue of the glow went from white to yellow and from yellow to orange and then from orange to red it seemed to get darker and darker until the entire room became its own shadow and no where could the light be found. I couldn't walk across the room it was so dark. The man lurking in the doorway became a forgotten memory until I realized I was alone. Then I wondered what became of him. I couldn't hear a sound, not even the breathing of someone else so I had to assume that he had vanished. It would haunt me for some time until I would meet face to face with this man again. I knew there had been rumors about aliens and unexplained crashes in the desert and bright flashes of light shooting across the sky but in the Southwest when there is little to do the night can play tricks on you. I would discover, however, that the mystery was not only inside of me, but the answers as well. When I awoke it was chilly. I realized I was huddled up next to a rock somewhere out in the open desert. I seemed to be alright but I couldn't remember how I got there. For a time I realized I did not know my name, who I was or where I lived. Gradually all of these lost memories returned except for why I was there in the desert experiencing a rendevous with the morning sun. I looked toward the East and saw a man walking in my direction and there seemed to be a glow around him. I wasn't afraid. After all, I had just survived the night in the open desert. White Sands is what they call it and it does have a spiritual quality about it. Finally the man stood before me and asked me if I now was ready to learn the spiritual things we had talked about the night before. Obviously this left me stunned and full of questions. I said: "Where did you come from?" He smiled and said, "Shouldn't one of your questions be 'Where did I come from?'" I grabbed the first book on the shelf which seemed to be slightly askew. I flipped the pages and sure enough, an envelope dropped out. I looked into the envelope and on a piece of paper were the words "Roswell", "aliens" and "President Truman." 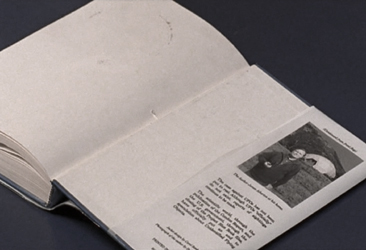 I really didn't understand the significance so I began reading the section of the book to see if there was any connection between the book and the envelope hidden between its pages. I realized it was a book on human anatomy and someone had made notes on one of the illustrations showing the human body. They marked the hands as having six fingers instead of five. It was then I knew I had something. I slipped the book with the envelope into the inside pocket of my jacket and left the room as quickly as possible. I got out of the car slowly and as quietly as I could. I could hear voices. I couldn't make out what they were saying but I did hear the word "craft" and also something about the soil being burned and ashes scattered here and there. I moved closer. Finally I could see some lights. Apparently it was just the light from their flashlights as they moved here and there seemingly looking for something. I heard someone gasp. "There's something over there," I heard them say in a louder than normal voice. I could hear them move through the brush. "What is it?" someone asked. "I'm not sure but it has six fingers," they replied in a voice loud enough for me to hear but not so loud they might attract attention. Roswell might not seem like a community of enormous activity but beneath the surface of what is revealed there is a circus of denial which is constantly being reissed and facts denied and evidence covered up. The one thing about military thinking is that it does not follow logic but rather adheres to a body politic of propaganda which changes daily and that in itself becomes a form of evidence which is difficult for the reporters of local happenings to interpret. All is revealed to be denied. The phone rang and it was the one local private detective we had learned we could trust. He told us that the local police department had been informed that we were being investigated for subversive activity and that national interest was at stake. My own background in the military was not going to help in this situation. Now I was considered a person of interest in the investigation of espionage and that people were being sought who know me and whatever activity I was currently engaged in. Now I knew that even a photograph of an alien craft was going to be evidence of a crime on my part. It was time to regroup and figure out how our investigation was going to be handled. "Finally we made it up to the top of the bluff where we could see the entire valley. The view from the Sandias is unusually spectacular when the sun begins to set and the colors in the sky turn from blue to purple and dance in the distance with the yellows and orange until it is almost like being in the Land of Oz. What better place to be to come so close to things unworldly? We could see for miles and we would know if anyone was coming or going. Just when we were almost hypnotized by the solar display we saw dust kick up in the distance. There was a caravan of military vehicles heading toward the location we had secretly been given the night before. We would wait until nightfall and under the cover of darkness we would be able to make our way closer to the secret activities which would explain so much about what we needed to know. If what we anticipated turned out to be true we would not only finally be relieved to know but we would suddenly feel afraid, so afraid of what we might yet expect to come. "What are you doing here?" I heard whispered to me from a few feet away. I 'bout leaped out of my skin. I thought I was alone and also it was freezing cold and there was a whistle of wind in the air. I turned and saw Jimmy from the bar I sometimes stop by near Kirtland Air Force base. "I... I... crap... you scared me to death. What are YOU doing here?" I really didn't want to tell him I was spying on some government people working late at night. "I saw your car and I forgot to pay you back for the ten bucks you loaned me the other night." Jimmy was a good kid but not too bright. I only wish he was smart enough to understand what was going on around New Mexico and why we had to keep quiet about it. "You didn't have to do that. I know you're good for it." I really didn't know how to get rid of him at this point but standing there talking in the dark didn't help me with what I was doing. "I know why you're here." Jimmy said. I was really creeped out now. I just stood and stared at him speechless.